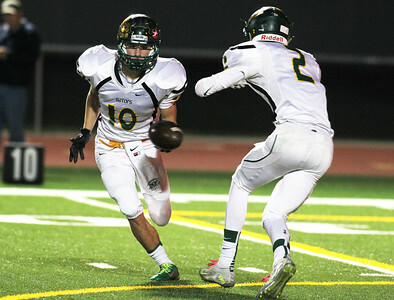 H. Rick Bamman - hbamman@shawmedia.com Crystal Lake South's Scott Coughlin (10) hands off to Kory Olsen on the kick off on Friday, Oct. 9, 2015. 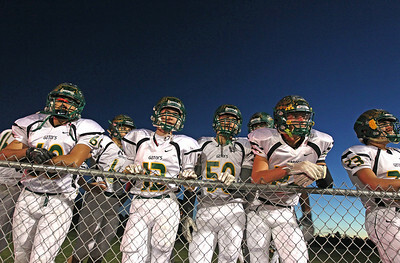 H. Rick Bamman - hbamman@shawmedia.com Crystal Lake South players wait to enter the field to play against Huntley on Friday, Oct. 9, 2015. 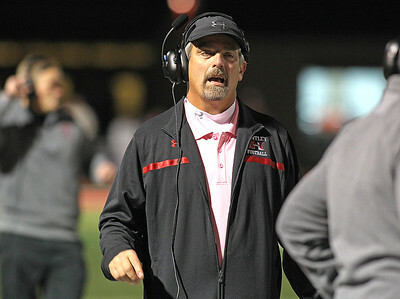 H. Rick Bamman - hbamman@shawmedia.com Huntley's head coach John Hart roams the sideline durig the game against Crystal Lake South on Friday, Oct. 9, 2015. Huntley is undefeated this season 7-0. 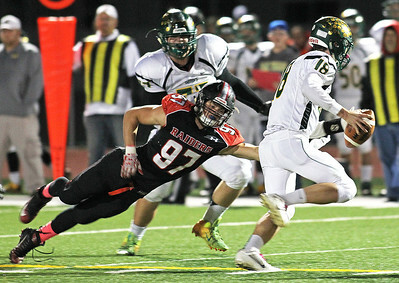 H. Rick Bamman - hbamman@shawmedia.com Huntley's Caleb Jones (97) reaches for Crystal Lake South quarteback Luke Nolan in the first half in Huntley on Friday, Oct. 9, 2015. 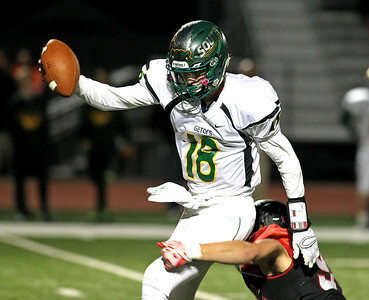 H. Rick Bamman - hbamman@shawmedia.com Crystal Lake South's Matthew Meyers (2) returns an interception against Huntley in the first half on Friday, Oct. 9, 2015. 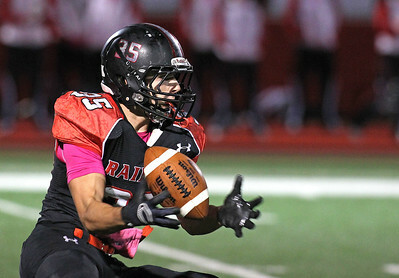 H. Rick Bamman - hbamman@shawmedia.com Huntley line backer Dylan Macari runs for a first down in the first quarter against Crystal Lake South on Friday, Oct. 9, 2015 in Huntley. 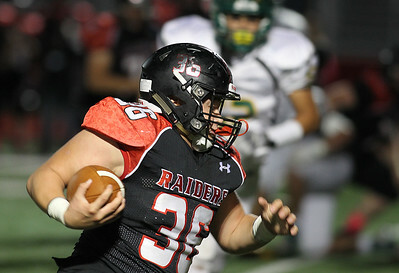 H. Rick Bamman - hbamman@shawmedia.com Huntley's running back Erick Mooney out runs Crystal Lake South defenders on Friday, Oct. 9, 2015. 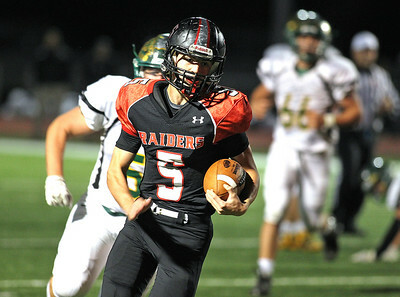 H. Rick Bamman - hbamman@shawmedia.com Huntley's Tim Ryan grabs a Crystal Lake South punt in the first half on Friday, Oct. 9, 2015. 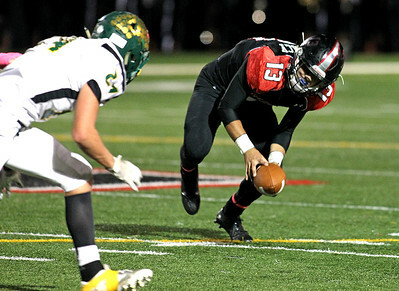 H. Rick Bamman - hbamman@shawmedia.com Crystal Lake South's quarterback Luke Nolan slips away from Huntley's Steven Puff in the first half in Huntley on Friday, Oct. 9, 2015. 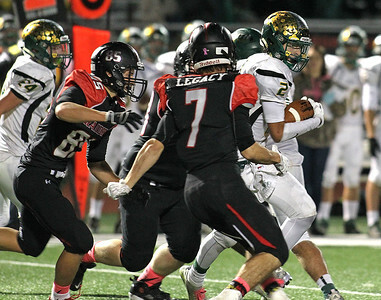 H. Rick Bamman - hbamman@shawmedia.com Huntley's Tim Ryan (35) is slowed by Crystal Lake South's Blake Martel (28) and Brandon Mazzaferro (22) in the first half in Huntley on Friday, Oct. 9, 2015. 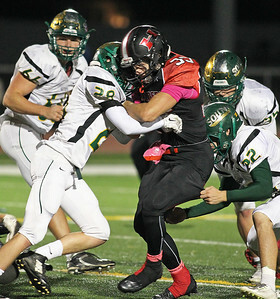 H. Rick Bamman - hbamman@shawmedia.com Crystal Lake South's Michael Swiatly (24) chases Huntey's Anthony Binetti out of the pocket in th first half in Huntley on Friday, Oct. 9, 2015. 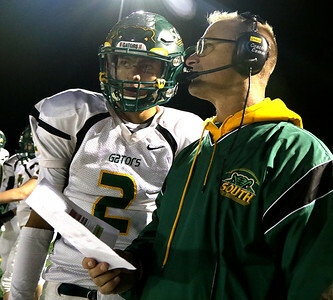 H. Rick Bamman - hbamman@shawmedia.com Crystal Lake South head coach Chuck Ahsmann sends in a play with wide receiver Mattew Meyers in the first quarter on Friday, Oct. 9, 2015. 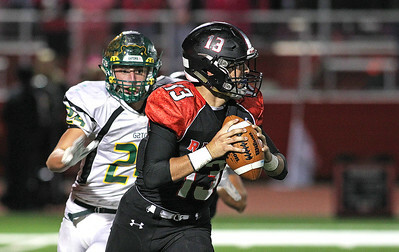 H. Rick Bamman - hbamman@shawmedia.com Huntley's quarterback Anthony Binetti picks up a mishandled snap in the first half against Crystal Lake South Crystal Lake South on Friday, Oct. 9, 2015. 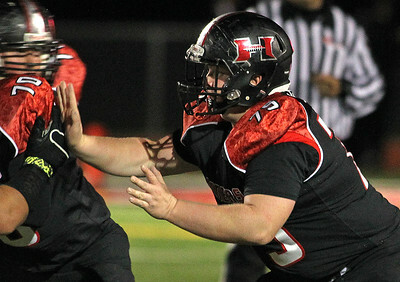 H. Rick Bamman - hbamman@shawmedia.com Huntley offensive lineman Kyle Witt blocks against Crystal Lake South on Friday, Oct. 9, 2015. 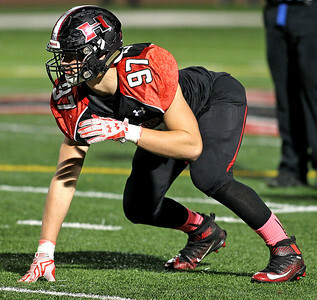 H. Rick Bamman - hbamman@shawmedia.com Huntley defensive lineman Caleb Jones on the line against Crystal Lake South on Friday, Oct. 9, 2015. 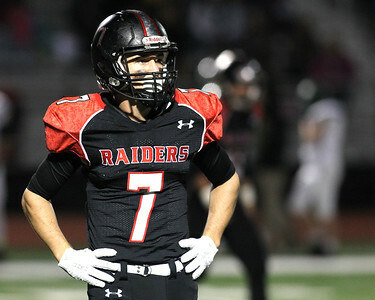 H. Rick Bamman - hbamman@shawmedia.com Huntley wide receiver Alec Coss waits for tha play against Crystal Lake South on Friday, Oct. 9, 2015. 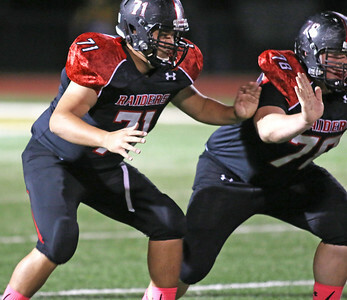 H. Rick Bamman - hbamman@shawmedia.com Huntley offensive linemen Zack Vretenar (71) and and Andrew Pertzborn (78) block against Crystal Lake South on Friday, Oct. 9, 2015. Crystal Lake South players wait to enter the field to play against Huntley on Friday, Oct. 9, 2015.